Once commonly found in cottage gardens and orchards through Britain blackthorn bushes, crab apple trees and quince trees are now rarely cultivated. Blackthorn is more likely to be found growing wild in a hedgerow while crab apple trees may be grown solely for ornamental purposes in a garden. Neither crab apples nor quince are widely used in cookery today though once they were cherished for their medicinal as well as nutritional qualities. A blackthorn bush, if left to its own devices, can grow into a 20’ tree but it’s more likely to be found as part of mixed hedgerows throughout Britain. It’s very popular with wildlife, especially caterpillars and nightingales, providing food and shelter but it’s also been imbued with other qualities over the centuries. In Ireland it’s said that little people live in, and guard, blackthorn bushes, and if you pick some of its branches on 11th May or November, then bad luck will befall you. Traditional herbalists have relied on the medicinal properties of blackthorn to settle stomach complaints and to ward off influenza. But be careful because too much will cause constipation! 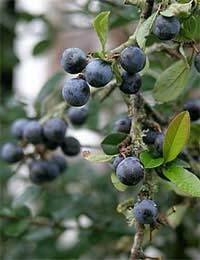 But it’s with the preparation of sloe gin that the dark blue-black fruit of the blackthorn is most commonly identified. Gather the sloes during late September and October. Eaten raw they are very bitter although it’s said if you refrain from harvesting until after a few frosts they will taste better. In any event, you should wait for frosts before gathering as it will soften the skin allowing the gin to seep in and absorb the almond flavour of the sloes. To make sloe gin, you’ll need about 1 lb sloes to 8 oz sugar to 1 litre gin. Prick the sloe skins all over and place them in a sterilised jar. Cover with sugar and pour in the gin. Seal and shake well. Store in a cool cupboard shaking frequently for about 2 months. At the end, you will have a pink flavoured gin ready for Christmas. We tend to think of crab apple trees (Malus) as being for ornament only but, like blackthorn, they provide enormous benefits to garden wildlife, providing food for birds and a home for up to 90 different sorts of insects. They also attract bees, which help to pollinate other apple or fruit trees in the garden. They have pretty pink or white blossom in spring and the miniature varieties can be grown in pots or on patios. The apples are small and sharp and not usually eaten raw but because of their high pectin content make a very good jelly to serve with cold meat and game. To make crab apple jelly, roughly chop about 3 lbs of crab apples. Place in a saucepan with a lemon, quartered, and cover with water, Bring to the boil and simmer for about 1 hour, adding more water if needed. Drain through muslin or a jellybag. Add 1 lb of caster sugar per pint of juice and gently bring to the boil, stirring until the sugar dissolves. Add a cinnamon stick and allow to boil until it reaches setting point. Test by placing a teaspoonful on a cold saucer and pushing it with your finger. If it creases, it’s ready. Pour into jars and seal. Quince trees (Cydonia Oblonga) used to be a common feature in British gardens but they've declined in popularity over recent years, which is a pity, as the fruit has a beautiful perfume. It was the ‘golden apple’ that Paris gave to Aphrodite in Greek legend as a symbol of love. Quince was used medicinally to treat stomach problems, sore throats and eye infections. And such is their perfume that they were used to deodorise rooms! Quince probably has its origins in Asia and the Middle East but has been cultivated in the Mediterranean lands for thousands of years. Its Portuguese name is marmalo from which we get marmalade and quince is often made into a preserve or can be cooked and served, like apple sauce, with meat and game. It can also be added in small quantities to fruit pies to give an extra unusual flavour. Quince fruits don’t appear until later in the summer and in Britain need to be picked and allowed to ripen indoors as the cooler weather of autumn encroaches. Because their beautiful scent develops as they ripen they were traditionally kept in the underwear drawer belonging to the lady of the house. But if you are planning on storing them, keep them away from other fruit unless you want them all to smell of quince. Crab apples were never as common as cultivated eating, cooking and cider apples. Sloes were replaced by damsons which are just as hardy but larger. Plums are sometimes used in cooking to, although most are eaten raw. Quinces never did as well here as pears which are much more versatile in our climate. Pears can be eaten raw or cooked - quinces in our climate are rock hard and only good for cooking. So really all these three fruits were replaced by better alternatives. Crab apples are still widely grown as ornamentals (often hybrid varieties though) whilst sloes are common in hedges. Only quinces have truly disappeared out of those three, but they're making a bit of a comeback as people look for something other than apples to grow. Really this post should have mentioned other fruits such as medlars and mulberries which used to be quite common in England. Also other fruits such as grapes which were occasionally grown but not as common have made a come back. There are also figs and peaches which have been grown here for a long time, but never on a large scale.